What Do You Do With Your Longevity Raise or Years In Service Raise? The military enjoys what is called a longevity raise every two years. Every two years, members of the military receive a raise in the month they began their military career for their service and experience. 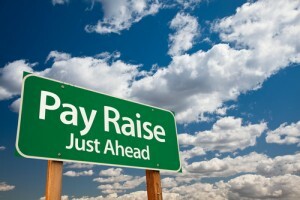 This raise is in addition to the military’s annual cost of living adjustment raise that they receive in January. The longevity raise is very similar to what a civilian would receive after an annual performance review. But, what do you do with your bi-annual raise? Do you save it? Do you spend it? Do you even realize that you earned it? What if you saved it in your Thrift Savings Plan? How Much Is The Longevity Raise? While the percentage of the pay raises varies between 2% to 5% depending on certain ranks in the military and the military’s need to retain those individuals, the average raise is 3.5% every two years. The pay raises take place during the same month that the service member entered military service. So, for example, an Army Captain earns $4,883 each month in base pay only. This does not include Basic Allowance for Subsistence (BAS) and Basic Allowance for Housing (BAH). That same Army Captain will earn a $234 monthly increase after crossing the six year mark of service. What Do You Do With Your Raise? Receiving this raise is an excellent opportunity to increase the amount of money that you invest in the Thrift Savings Plan, the federal government’s version of the 401k retirement plan offered to civilians in corporate America. It is very hard for a young member of the military just starting in his or her career to contribute the maximum contribution limit of the Thrift Savings Plan, $16,500, right away. But, starting small and then increasing your Thrift Savings Plan contributions by 1% or 2% every other year will help you get closer to that goal of maximizing your TSP contributions. Using the example discussed earlier, $234 saved every month over the course of a 20 year military career in an investment earning 8% annually will accumulate to over $134,000 by the time that member of the military is ready to retire at the twenty year mark. By increasing your TSP contributions \when you earn pay raises, you do not feel the impact of losing money from your monthly budget. It was money that was never there before. You were living for two years without that extra money, and now investing a portion of your new raise for retirement in an investment such as TSP should not affect your budget or lifestyle very much or at all. Previous post: Understanding The Rules As To Who Can Contribute To A Roth IRA?